Stephanie Martin is a Canadian conductor and composer. By the time this review appears she will have stepped down as conductor of the Pax Christi Chorale after twenty years in post. She’s also a past Director of Music at the Church of St Mary Magdalene, Toronto, the church where Healey Willan was Director of Music (1921-68). I see from her website that during her time with Pax Christi Chorale she’s conducted them in a wide range of demanding repertoire. In particular, she’s expressed her affection for English music through performances of, inter alia, Elgar (The Kingdom, Dream of Gerontius and Music Makers) and Parry (Judith – the North American premiere – and, very recently Ode on the Nativity.) Her farewell concerts at the end of April consist of a pair of performances of Elgar’s The Apostles, the first of which is the work’s Canadian premiere. She’s retiring from conducting Pax Christi Chorale, I understand, in order to devote even more focus to her work as a composer. The appearance of this disc of her music is, therefore, especially timely. Almost all the music on the disc is for choir but I’ll deal first with the two exceptions. Canterbury and When You Are Old are solo songs, sung here by baritone Michael Robert-Broder accompanied by Nicole Bellamy. Robert-Broder is a fine singer, his voice firm and well-focussed. His diction is admirably clear. Canterbury is a calm and rather lovely song setting a poem by the Canadian poet, Douglas LePan (1914-1998) which refers to the martyrdom of Thomas Beckett. The vocal line, supported by a delicate piano part, is very melodious and the music displays a fine sensitivity to words. W B Yeats’ When You Are Old is set to an easy, fluent vocal line; it’s a very good response to the poem. On this evidence Stephanie Martin is a fine song writer. I enjoyed the singing of Michael Robert-Broder very much. 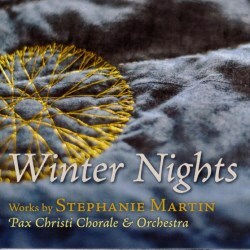 The most substantial offering on the disc is Winter Nights, a set of five pieces for chorus accompanied by a small group of strings and two percussionists. The first piece, Cold is the Night sets an anonymous text for a cappella choir. I like the clarity of the words and of the vocal lines in this performance. Loud Rings the Frozen Earth, a setting of James Thomson (1700-1748), is more vigorous though the pace relaxes for a calm tenor solo, sparingly accompanied, midway through. In this piece I admire the way the percussion section is used to colour the music. Christmas Cattle sets a poem by the Canadian poet, Cori Martin (b 1959) which imaginatively complements Thomas Hardy’s poem, The Oxen. Here Stephanie Martin’s music is pleasingly warm and melodious and the string accompaniment put me rather in mind of Vaughan Williams and Finzi; I definitely sense an English accent here. Ring Out, Wild Bells sets Tennyson’s famous New Year lines for unaccompanied chorus. For the most part the music is energetic and the singing of Pax Christi Chorale is lively. The music to which the final stanza, ‘Ring in the valiant man and free’ is set is more reflective in tone. The sequence ends with Now Winter Nights Enlarge in which lines by Thomas Campion (1567-1620) are set. The full forces are deployed here and the music is varied and attractive. Among the individual pieces on the disc which I admired was Of the Glorious City. This is a setting of a text by Julian of Norwich for unaccompanied choir in which the writing seems to me to be not only effective but also eloquent. Rise Up My Love, which takes words from the Song of Solomon, is calm and lyrical, the music characterised by long, expansive phrases. The famous text God So Loved the World is interesting in that the choir is not so much accompanied but, rather, their music is decorated by a flute and an oboe; this works very well. The programme ends with Now the Queen of Seasons for which the choir is joined by brass quintet, timpani and organ. This is an uplifting ending to the disc. I like the music on this disc very much. It’s unfailingly attractive and it’s clear that Stephanie Martin has an excellent understanding of the human voice and of how voices come together in choirs. I’m sure everything on this disc is enjoyable and rewarding to sing and Miss Martin certainly communicates very well with her listeners. She also evidences a discriminating eye for a text and fine empathy for the words she chooses to set. Her well trained choir sings for her with commitment. The recording has clarity and is perfectly satisfactory. However, I got no sense at all of the acoustic of the building and though the performances were set down in a church there’s no evidence of the natural resonance of the building. In fact, the sound gives the impression that the recordings were made in a studio and the performances are just a fraction too closely balanced, which is rather a pity. While I’m glad to be able to hear the music clearly just a little bit of distance on the sound could have imparted a pleasing aura. However, despite this the recording is quite acceptable. All the sung texts are included in the booklet but there’s not a great deal of information about the music other than details of for whom some of the pieces were written. It would have been nice if Stephanie Martin had written some notes to introduce her music. I’m afraid I can’t tell you, for instance, when any of the pieces were written though I suspect most were penned in recent years. I imagine that Stephanie Martin’s music is quite well known in choral circles in North America; it deserves to be. I hope that this disc will bring her music to the attention of more ensembles. I’m sure the singers of Pax Christi Chorale will miss her leadership but if she has more time to devote to composition that can only be a good thing.